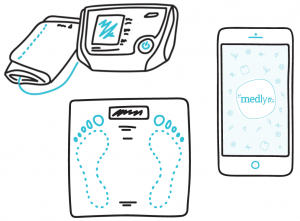 The Medly smartphone–based telemonitoring program for heart failure management was developed by eHealth Innovation at the University Health Network (UHN) to assist patients and clinicians with the management of heart failure. For a comprehensive overview of Medly, click here to download the Medly Whitepaper. The Medly program was developed by an integrated public sector team of heart failure specialists, researchers, engineers, designers and human factors experts. As such, the program is not only evidence-based, it is infused with the practical clinical knowledge and processes of Canada’s leading cardiac care centre. In addition, the Medly program continues to be rigorously evaluated, enabling the continuous deployment of clinically-valid and user-tested enhancements to both the system and delivery models. Recently, the eHealth Innovation team has sought to marry fundamental techniques of Service Design with the field of Implementation Science to ensure that all deployments of the Medly program achieve a high level of integration success in a range of cardiac care settings.